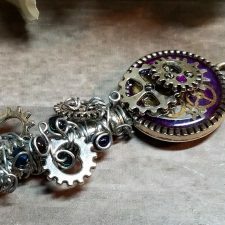 Time Flies in this unique Red Steampunk Angel Wings Necklace. Red, gold, and silver Watch parts lie upon a bed a rich red background inside of wings in this gorgeous piece of jewelry. 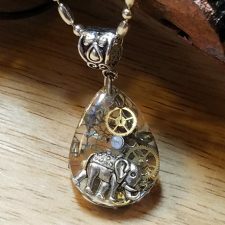 This one of a kind pendant is a unique gift idea for anyone who loves steampunk or one of a kind jewelry. This unique necklace will make the perfect anniversary gift for the one you love. All of my items are one of a kind, unique pieces of wearable art. No two creations are ever quite the same. You aren’t just buying jewelry, but a piece of original art. 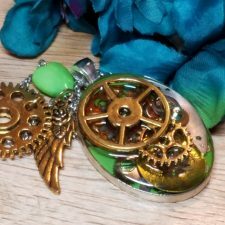 Beautifully painted red wings filled with steampunk gears come together to create this original Red Steampunk Angel Wings Necklace by The Steampunk Buddha. Red Steampunk Angel Wings Necklace make a beautiful accent to anything you wear. 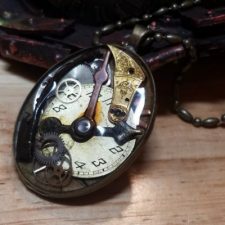 Carefully inlaid with tiny watch pieces, gears, then layered with larger gold gears, this one of a kind Steampunk Pendant. Red Steampunk Angel Wings Necklace is the perfect accessory to complete a steampunk cosplay costume or a unique gift for anyone who loves steampunk style. 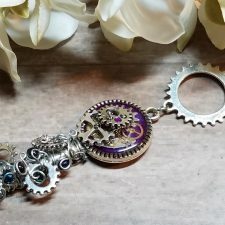 Wear Red Steampunk Angel Wings Necklace with jeans and a t-shirt, a dress, evening wear or add it as an accessory to your favorite steampunk outfit! 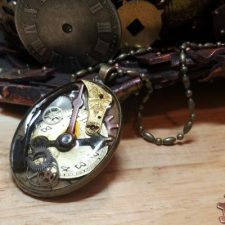 This red steampunk pendant is a great unique gift for anyone who likes one of a kind jewelry, steampunk and enjoys showing off show-stopping jewelry! Red Steampunk Angel Wings Necklace is a custom design found only at The Steampunk Buddha. 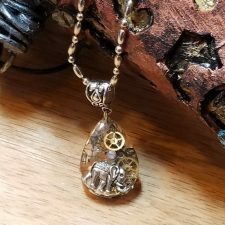 This necklace is handmade and one of a kind. It is READY TO SHIP NOW. The setting is cast and plated with an antique silver finish. It is approximately 3 inches by 2 1/2 inch, and the paint and watch parts are covered in epoxy resin. This is a custom design by our artist Bex. The background is painted in tones of red with real watch and clock pieces embedded inside. Silver-tone, chain is connected to the necklace by a connector and is included. 28-inch silver tone chain necklace included.